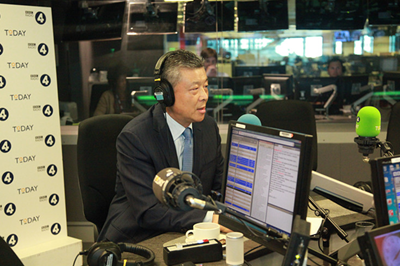 On 29 June 2017, Ambassador Liu Xiaoming gave an interview on the Today programme of BBC Radio 4 hosted by John Humphrys, in which he shared his views on the progress and achievement of Hong Kong Special Administrative Region since its establishment 20 years ago and the success of "one country, two systems" policy. He also answered questions about Hong Kong's political reform, China's place in the world and North Korea. 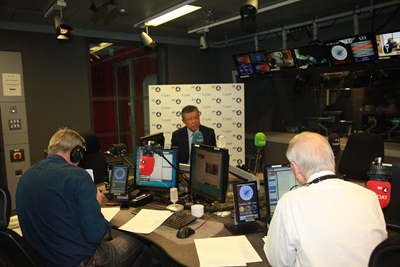 Humphrys: I am joined in the studio by the Chinese Ambassador to this country, Liu Xiaoming. Good morning to you. Humphrys: Isn't it the reality that it is "one country", increasingly,"one system"? Liu: No. I think "one country, two systems" has been implemented with great success. I can't agree with some of the interviews aired just before me saying that China did not deliver its promises. As a matter of fact, the Central Government of China delivered everything it promises, that is "one country, two systems". I think that basically Hong Kong has maintained its social, economic system, way of life, rule of law, and I think Hong Kong now is much better placed compared with 20 years ago. So this is really an occasion for us to have a grand celebration. I think in the past 20 years we've seen Hong Kong maintaining prosperity and stability, the GDP doubled, and foreign exchange reserve quadrupled. Hong Kong still remains a global centre of finance, trade and shipping. The life expectancy of its people increased tremendously. They are ahead of many developed countries. So I would say people in Hong Kong are now living longer and living happier. Humphrys: Nobody I think would argue that there has been economic prosperity in Hong Kong. That is accepted. But listen to what somebody like Anson Chan, the former chief secretary of both the British colonial government and the Hong Kong Special Administrative Region says. She makes the point that we are seeing now and it has been seen, over the last twenty years, a serious erosion of the rights and the common law, the independent judiciary. The impression we get, she said, is that China is determined to tighten its grip, and there is clear evidence for that, isn't there? Liu: Let me say: 20 years ago, did you have election in Hong Kong? Who elected the governor of Hong Kong? Humphrys: It was a colony. Nobody would argue other than that. It was a colony and there was a governor there and it was fine. Liu: In the past 20 years there were 5 elections in Hong Kong. Humphrys: And the last leader was elected with 777 votes, 0.03 percent of the registered electors. That doesn't sound very convincing. Liu: Number does not tell you everything. Humphrys: It tells you a lot in a democratic system. Liu: What about here in the UK? What about UK's national leader? You have 65 million people and your national leaders get elected from their constituency of tens of thousands of voters, by a very small majority. People can challenge that it doesn't represent the population of the entire country. Liu: You have to achieve this through incremental, gradual process and step-by-step. As we say, Rome or maybe London is not built overnight and Hong Kong is not built overnight. Humphrys: In 2015 there was the abduction, that you may very well know, of 5 book sellers all of whom were involved in publishing books with gossipy and critical titles about China's elites. We know what happened while they were arrested when one of them, when he was released, he held a press conference in which he expressed that he was forcefully detained by Chinese authorities and was put in solitary confinement for 8 months for selling books. Humphrys: Voluntarily? They left their home, left their businesses and they just went off to China on their own? Voluntarily? Liu: On their own, voluntarily. They expressed this in their press conference. I read some reports about the so-called arrest, they've been taken to China by coercion, by force...There's no truth in it. Humphrys: No truth in it? Liu: No truth at all. Whom should I believe? Do we believe them who said this on their own or do we believe in rumors ? Liu: I've already told you what I heard. Humphrys: Alright, let's move on from that. Humphrys: There are always discontented people but we do not lock them up. Liu: No, not locked up at all. Humphrys: Why in that case do you think that the foreign office says... You know there was a report by the foreign office in February 2016 and Boris Johnson, our present Foreign Secretary, has said in the case, going back to the case of booksellers, he talks about the involuntary removal from Hong Kong to the mainland constitutes serious breach of the Sino-British Joint Declaration by underming the "one country, two systems" principle. And that is what the British Government fears has happened, that is, the principle has been undermined. Liu: I think when you read the report, first of all, we disagree with this so-called Report on Hong Kong, which was published twice a year. We think Hong Kong is an integral part of China, and Hong Kong's affairs are internal affairs of China. It's not for foreign governments to interfere. Having said that, even with this report, the British Government commends the Chinese Government for implementing "one country, two systems" and they believe "one country, two systems" is a great success. There are some differences between China and the UK but on the whole we all believe that long-term stability, long-term prosperity in Hong Kong are in the interests of not only China but also in the interests of Britain and the international community. On this so-called book sellers' case, we had quite a few interactions, discussions on the government levels. I personally engaged with British officials from Foreign Office and we told them what we heard and what we believed are the facts. Humphrys: And many people looking at your country from the outside believe that the facts are the elections are orchestrated, the protesters are locked up and democracy is being weakened rather than strengthened and your response now, in the end, is to say that it's our country. Liu: When you say "one country, two systems", I think some people forget that this is one framework. You have to remember that Hong Kong is part of China, not part of UK, and not a so-called independent entity. Humphrys: And therefore it has to be a single system? Liu: Two systems. You told me your last visit to China was 12 years ago. You need to go to Hong Kong, to go to China, to see the changes. Even in the area where we have a difference, on democracy, you have to compare Hong Kong today with Hong Kong 20 years ago. You have to compare Hong Kong now with Hong Kong one year, two years ago. Humphrys: Can we talk about China's place in the world at large? Do you see the day, perhaps not very far away, when China will be the world's great superpower instead of the United States, as it is today? Liu: I do not foresee that China will become a superpower in the foreseeable future. I believe China is still a developing country. Humphrys: Even when China becomes the largest economy in the world? Liu: Even when China becomes the largest economy in the world, it will take a long way for China to become so-called superpower. China is a large country, and there are great differences between regions. After serving as Ambassador in Egypt, I was seconded to one of the poorest provinces in China, Gansu. It is very poor, much poorer than, the Americans used to call their west "Wild West", I think it's poorer than "Wild West". Humphrys: So what will it take, as you've said, you are the second largest economy, you may very well very soon become the largest in the world, so what will it take for you to be the world's superpower? Humphrys: Just a final thought about North Korea and its threat to, potentially, world peace. What would it take for North Korea to so disturb you in Beijing that you will take action against the North Korean regime? What would they have to do for you to say, enough, we are now going to intervene? Liu: China has done a lot. Before I came here I was Ambassador in North Korea--I'd been there for 3 and half years. China actively engaged with North Korea. We tried to persuade them to give up their nuclear programme? Liu: On the other hand, the United States, South Korea and other countries should also take steps. They should suspend their military exercises. Each time I tried to persuade North Koreans to give up their nuclear programme, they said, we are threatened by big superpower, the States, joined by their allies. They have done many military exercises directed at North Korea. So we are calling for "dual suspension": North Korean suspend their nuclear program; Americans, South Koreans, their allies suspend their military exercises. Then we return to the negotiation table and start talks to find solution for a nuclear-free Korean Peninsula and a mechanism for lasting peace. We call it "dual track". Humphrys: Alright, Ambassador, many thanks for joining us. Liu: Thank you for having me.